About the River - TUBE SAN MARCOS! 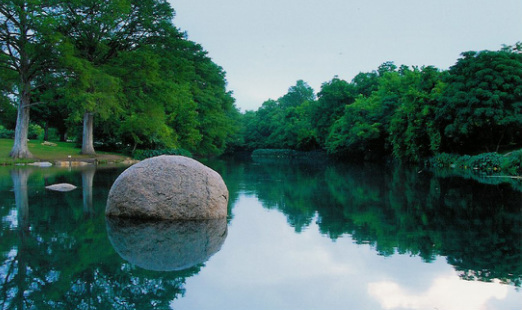 One of the most loved family recreation areas, the San Marcos River, bubbles to life from hundreds of springs right in the City's center. Always a refreshing 72 degrees, the river is enjoyed year ‘round. Rio Vista Park, where the Lions Club Tube Rental shuttle will pick you up, is a relaxing area that includes pavilions, picnic tables, and children's play park. The river at this area has deep pools to swim and float that flow into the three chutes known as Rio Vista Falls. It's great fun to shoot the falls over and over again! Help keep the San Marcos River beautiful. Mesh trash bags are tied to your tubes for convenience during your time on the water. Trash cans are located in and around the park and shuttle pick up area. Please dispose of your trash and recyclables properly. Wearing water shoes or athletic shoes is recommended. Rocks are in some areas. Bring a waterproof pouch or zip-loc freezer bag for necessities you need to keep dry. Drink liquids to stay hydrated. Wear hats and/or sunglasses you won't mind losing. Bring a rope if you want to tie multiple tubes together. Lockers are available and can be used to store valuables or miscellaneous items. The Lion's Club sells many items you may have forgotten including ice, coolers, refreshments and snacks, sunscreen, sunglasses, googles, water shoes, life jackets, floaties and more. Park Curfew 11pm to 6am. No overnight camping allowed. Styrofoam of any kind is not permitted in parks or river - this includes ice chests, cups, to-go containers, plates, floats, kick-boards, toys, etc. Alcohol is allowed in river but not permitted in parks. Keep the lid of your ice chest latched and secure. Parking is for park use only. Please park in designated areas. Motorized vehicles not permitted on trails. All wildlife and habitat protected. Please avoid endangered Texas Wild Rice that grows in the river. allow the Lions Club to support many charities and educational opportunities for students.